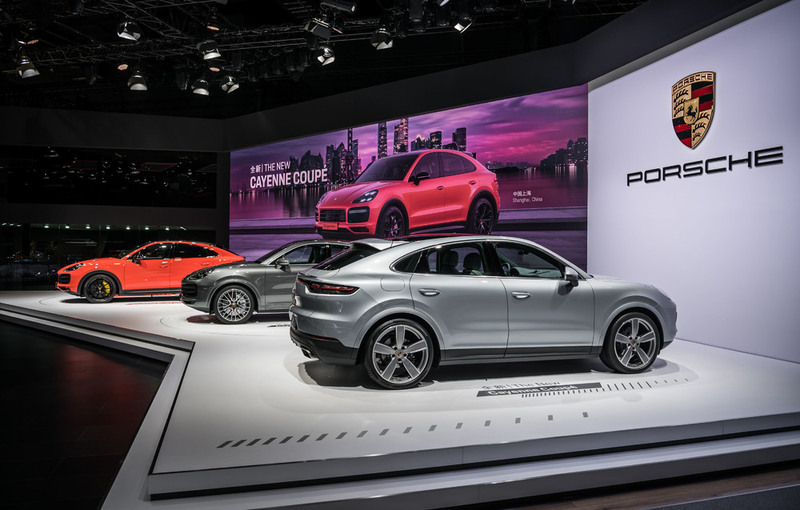 Big entrance for the Cayenne Coupé: the new SUV model from Porsche celebrates its exhibition premiere at “Auto Shanghai”, one of Asia’s most important motor shows. The new Porsche will be on view there until April 25, and will play a major role in the further growth of the sports car manufacturer in China. The new Cayenne Coupé is equipped as standard with a 2.16 m2 panoramic fixed glass roof. A contoured carbon roof is available as an option. It belongs to one of a total of three optional lightweight sports packages, which also include the Sport Design package and new, weight-reduced 22-inch GT Design wheels as well asseat centres in a classic checked fabric. The new Cayenne Coupé offers plenty of space for up to four people as standard. At the front, sports seats with integrated head rests offer comfort and optimum lateral support. In the rear, the Coupé is equipped with a rear bench with the characteristics of two individual seats. A rear seat system with three seats is available as an alternative at no extra cost. Rear passengers sit 30 millimetres lower than in the Cayenne . The luggage compartment has a capacity of 625 litres and is therefore ideal for everyday use. This increases to 1,540 litres ( Cayenne Turbo Coupé: 600 to 1,510 litres) when the rear seats are folded down. The extensive standard equipment includes speed-sensitive Power Steering Plus, 20-inch alloy wheels, front and rear Park Assist including rear view camera, Porsche Active Suspension Management (PASM) and the Sport Chrono Package. With over 80,000 shipped vehicles, China was once again the biggest individual market for Porsche in 2018. “It’s fascinating to see how interest and enthusiasm for Porsche has grown in recent decades in China,” says Jens Puttfarcken, President and CEO of Porsche China. The first Porsche Experience Centre in Asia was opened a year ago in Shanghai for the growing fan base in the Far East. It is located at the Shanghai International Circuit and includes a 10-hectare site where visitors are offered unique experiences based around Porsche vehicles both on and off the track. “More than 10,000 guests have already visited the Experience Centre,” says Puttfarcken. In addition, the first official Porsche Club China was established in 2017, and now boasts over 6,500 members. Porsche drivers from all over China meet online as well as in real life in this club and talk about their shared passion. Further information on the official fuel consumption and official, specific CO2 emissions of new passenger cars is available in the publication entitled “Guidelines on fuel consumption, CO2 emissions and power consumption of new passenger cars”, which is available free of charge from all sales outlets and from Deutsche Automobil Treuhand GmbH (DAT).